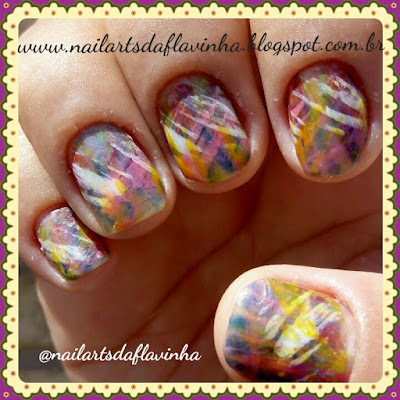 Nail Arts da Flavinha: Nail art com pincel leque. Nail art with brush range. 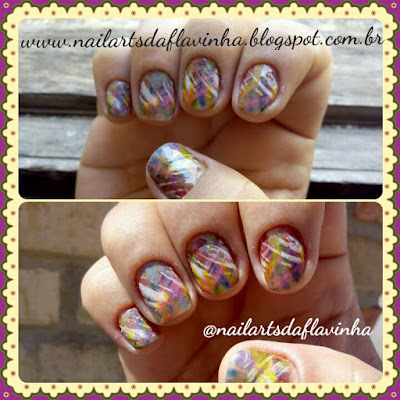 Nail art com pincel leque. Nail art with brush range. Esta semana não vou pintar as minhas unhas, vou deixá-la respirar um pouco e cuidá-las para fortalecê-las. Entretanto, minha irmã pintou as dela e utilizou um adesivo que fiz com pincel leque. This week I will not paint my nails, I will let her breathe a little and take care of them to strengthen them. However, my sister painted hers and used an adhesive that did brush range. Utilizei um pedaço de caixa de leite e comecei a pintar com as extremidades do pincel (pois achei que o efeito ficava melhor do que utilizando o meio) e fui fazendo pequenos traços ao longo da tira da caixa de leite cor por cor até ficar com o design desejado. 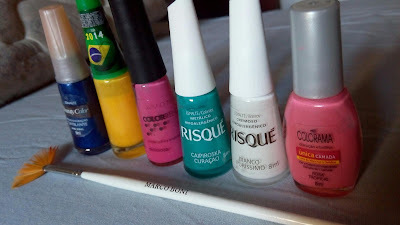 Fui misturando aleatoriamente as cores até achar que tinha ficado com um efeito legal. 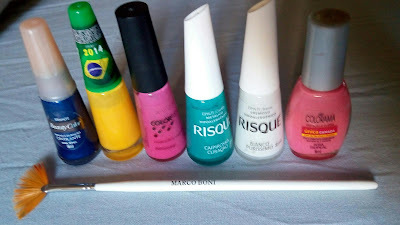 O esmalte branco foi o último que usei e por pincelar no sentido contrário do que estava fazendo, ele ficou bem destacado e deu um toque diferente na pintura. Espero que tenham gostado e até a próxima!!! Vou tentar fazer um vídeo mostrando como se faz. I used a piece of carton of milk and started to paint with the ends of the brush (because I thought the effect was better than using the medium) and was making small dashes along the strip of color milk box by color to keep the desired design. I randomly mixing the colors to find that had stayed with a cool effect. The white enamel was the last one I used and brush in the opposite direction of what he was doing, he was well highlighted and gave a twist in the paint. I hope you enjoyed and see you soon !!! I will try to make a video showing how it's done.